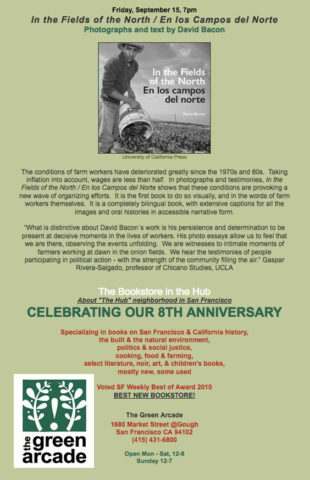 Join Author and Photo-Journalist David Bacon on September 12th from 6-7 pm at 2521 Channing Way in Berkeley. 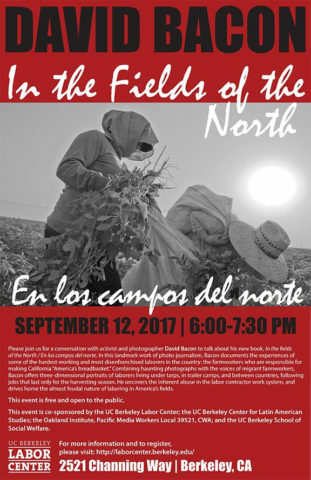 He will be talking about his new book “In the fields of the North”. The book highlights the hardest-working and most disenfranchised laborers in America. This is the time to learn more and stand in solidarity with the Latino community. This event is free and open to the public. Can’t make it on the 12th? Join David on Friday September 15th at 7pm at the Green Arcade in San Francisco (1680 Market Street 94102). This entry was posted in Events, Front on September 6, 2017 by Admin8. Their failure to respond shows that the letter to Ms. Herning was full of empty threats and designed to intimidate.